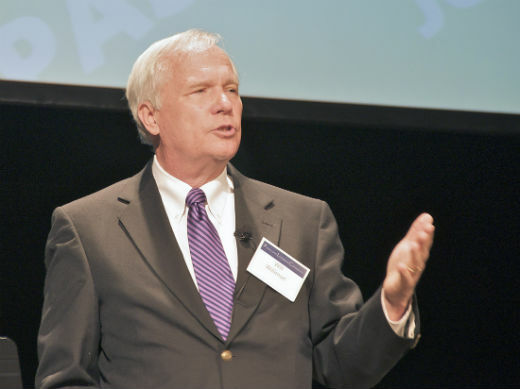 Dr. William H. Willimon recently stepped down as the Bishop of the North Alabama Conference of the United Methodist Church. He had previously been a Professor of Christian Ministry at Duke University. I have never read any book by Willimon. I do want to read some, though. Several people have recommended Resident Aliens: A Provocative Christian Assessment of Culture and Ministry for People Who Know that Somthing is Wrong, which he co-authored with Stanley Hauerwas. I first heard of Dr. Willimon through Ben Witherington’s blog, where he favorably reviewed one of Dr. Willimon’s books. Since then, I have wanted to find out more about him. There have been moments when I wanted to throw in the towel and go do something for a living that was more useful, predictable and lucrative. In frustration and despair I decide that this is it – my last sermon. I have had it with them and with preaching. God can go find some other chump to clobber them with dependent clauses. I confess that it’s then that I know not whether to love or to despise God. Next week I’m back in the pulpit, whooping it up and glad to be flailing away at the saints one more time. Thus I have never ceased to be humbled by the extravagant claim of the Second Helvetic Confession that the preached word is the Word of God. Bonhoeffer said that preaching is more than the artful conveyance of useful information, more than instruction in sound doctrine. Preaching enables the risen Christ to walk among his people. In the pulpit, I’ve had a great vantage point for watching Christ walk, stride, sometimes cavort and run among his people. It’s enough to keep you preaching for forty years or more. I know some pastors who say that they love the ministry because they enjoy fraternizing with church people and they find sustenance in working with folks in need. I’ve not been one of those pastors. Rather what’s kept me going is God’s speaking to me, through me, despite me. I’ve served some interesting churches, with some fascinating people, but none of them as interesting or fascinating as the Trinity. All sermons, even my forty-minute tirades, are too short, because we preachers, no matter how long we go on, can never exhaust the mystery of the Trinity. We could go on forever because God does. Here at the end it has dawned on me that I’m running out of Sundays and that I’ll never preach all of the odd, exasperating, life-giving, wonderful biblical texts. The Bible is just too rich and effusively revealing for the brevity of my remaining days. And yet, here at the last, it’s comforting to know that because God is so talkative, and because God has so much left to reveal, by God’s grace maybe I’ll get to continue the conversation in Eternity. But I remind you that the first and most enduring “crisis of leadership” is named “Jesus Christ.” Jesus Christ not only assaulted our definitions of “God” and “Messiah,” but also disrupted and challenged our notions of leadership. From the first he predicted that the people in charge would reject him. Those early predictions are quickly validated by the response of the authorities to Jesus. From the first Jesus recruited odd leadership, surprising us by whom he called to lead his movement. Those whom the world regarded as marginalized, ill-equipped, poorly informed, not particularly spiritual or moral, Jesus named as “disciples,” confounding the worldly wise, promising these losers glory in his coming Kingdom. As bishop I am frequently reminded by the Holy Spirit that Jesus was crucified through the leadership of people like me, persons in positions of spiritual authority over others. As bishop, I’m closer to Caiaphas than to Saint Paul. Therefore I have found it a salubrious practice to have close by me King’s “Letter from a Birmingham Jail,” written by King to someone just like me. One reason why so many of our churches praise a rather trivial, allegedly concerned but essentially inactive God is that they haven’t attempted anything so bold and brash that they risk utter, embarrassing failure unless the first Easter women were right and Jesus Christ really has risen from the dead. Hesitant, circumspect practice of ecclesiology leads to a limp and trifling Christology. My life as bishop has been a rebuke to those theoretical academics who succumb to the docetic temptation to disdain concern with administrative, managerial structures of the church — Jesus Christ is really, fully, completely human; disembodied faith is not faith in him. I look forward to reading more of Dr. Willimon’s works, but I thought I’d give you a few quotations from his writings. These quotations make me excited to read more of Dr. Willimon’s works. I hope that they help you appreciate his wit and wisdom.